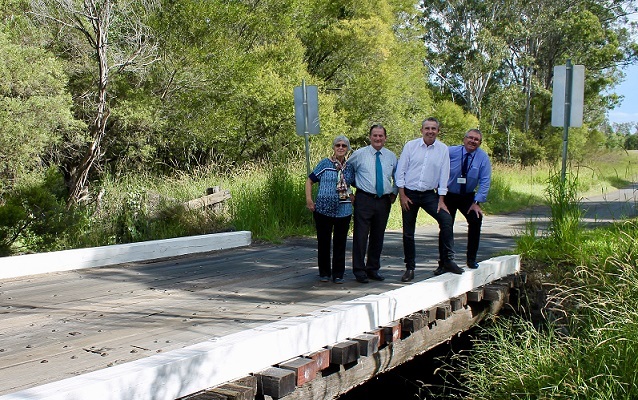 Federal Nationals Member for Page Kevin Hogan has announced funding for the replacement of two single-lane timber bridges in the Clarence Valley. The Kungala Road bridge and the Sherwood Creek Road bridge will collectively get more than $600,000 from the Nationals in Government. “The two timber bridges were in need of replacing,” Mr Hogan said. “The first bridge is on Kungala Road and is a single lane timber bridge that will be replaced with a two lane reinforced concrete bridge; it will be replaced at a cost of $689,030 with the Government contributing $344,515. “The second bridge is on Sherwood Creek Road and is a single lane timber bridge to be replaced with a single lane reinforced concrete bridge; it will be replaced at a cost of $570,750 with the Government contributing $285,375. Both bridges are decades old and approaching the end of their useful lives, requiring regular and costly maintenance. These upgrades will greatly reduce ongoing maintenance costs and remove any need for load limits to be applied.